On February 8th, MONSTA X released their second concept photos for ‘Take.2 We Are Here‘. Check them out below! Wonho is sporting blue and white hair for this comeback, while Jooheon has red hair while wearing an interesting headdress. 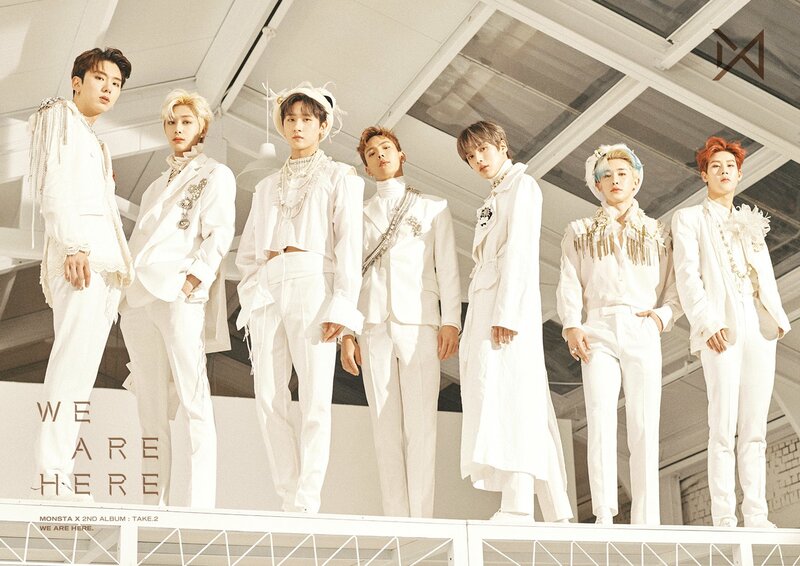 They look like princes in all-white outfits and an elegant setting as their background. This suggests that their upcoming concept could be related to royalty. Likewise, Minhyuk, Kihyun, Hyungwon and I.M are wearing lots of extravagant jewelry and accessories. MONSTA X will release their upcoming album ‘Take.2 We Are Here‘ on February 18th. This is a follow-up album to their album released at the end of last year in October ‘Take.1 Are You There?‘. Monbebes are excited to see what kind of concept will follow from their electrifying track ‘Shoot Out‘. Stay tuned! What do you think about MONSTA X‘s new concept photos for ‘Take.2 We Are Here‘? Let us know in the comments below.